Lightweight yet powerful, these javelin shoes are designed for high performance. They feature a midfoot strap to keep feet secure, a sharkskin-textured outsole and an abrasion-resistant toe cap made for dragging. 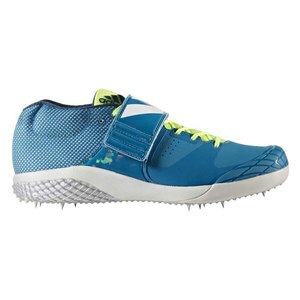 These javelin shoes bring power and speed to your approach run. A moulded hook-and-loop strap provides a lock-down fit, and the mesh back quarter and heel offers breathable comfort. A sharkskin-textured outsole and abrasion-resistant toe cap holds up to drag, while forefoot and rearfoot spikes grip wet or dry.